In the field of physical rehabilitation of children and young adults with disabilities, we often come across the problem of contractures in the soft tissues of the hip, knee, and ankle joint, resulting in subsequent inability to walk normally. Examples include: children with poliomyelitis, cerebral palsy, post-septic arthritis or osteomyelitis in the hip or knee. The approach in rehabilitation is to cure the active disease where possible, and to straighten the legs so as to get the child up and walking with orthopaedic appliances. 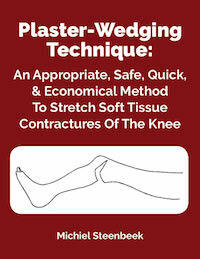 Wedging is a technique whereby the therapist cuts the serial plasters in a specific way, controls, and corrects the deformity progressively and re-enforces the plaster again.